An Evening Express staff photo ran with my story. Published June 4, 1981, this article for the Evening Express began my career as an arts and lifestyle journalist. Call it Punk rock [sic] or New Wave, and people will know what you’re talking about, although they might not know just what you mean. The two terms are as vague as they are suggestive. But when the music was hot at the Downtown Lounge on Portland’s Preble Street, there was no doubt about what lay at the heart of it all. Dancers would rise from their seats already dancing, swing around tables and chairs like some strange wind and bop into the madness on the dance floor like a shot out of nowhere. Some of the bands could have stood more time in the garage. But a good night at the Downtown Lounge made all the bad ones seem unimportant. 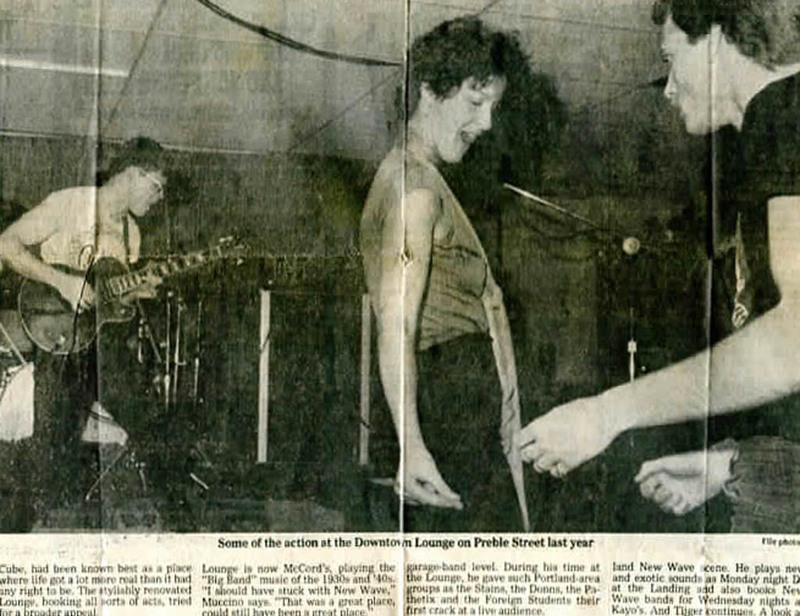 Like many other cultural forms, New Wave was already aging by the time it reached Portland, and the 11 months of Punk [the Evening Express capitalized it] frenzy at the Lounge were just a tiny reflection of the New Wave scene. Punk rock had emerged in the mid-70s as a protest against the emptiness presented to working-class British youth in place of a future. It became the rallying point on both sides of the Atlantic for a number of musical and visual artists and styles, some new, some holdovers from 10 or 20 years before. Another look at the DTL, benefiting from a decade’s hindsight (and better reporting skills). Punk was loud, fast, raw and basic. The lyrics were naive and cynical by turns and dealt with the failures of romance and the other holy grails of Western society. The lifestyle was deliberately shocking, a funhouse mirror distortion of the way people lead their lives. Punk applied the original exuberance of rock ‘n’ roll to a definite political and aesthetic stance; but for most young Americans, New Wave was less a radical political gesture than a return to exciting and unpretentious rock music. Punk was meaning, motion, color, the desperate laugh, where mainstream rock was just the prefab heartbreak, the studio romance, the quiet anguish over a scratch on the Mercedes. Will Jackson in a 1981 image that ran with the Evening Express story. Doug Hubley photo. After a two-year lag, the symptoms of Punkdom started to appear in Portland. The Punk boutique Tijger opened in 1979 in the Center Street “Fraternity House.” Late that same year, the owner of the Plaza Hotel, Fred Muccino, hired veteran nightclub ramrod Jim Peterson to renovate, and book acts for, his Downtown Lounge. Peterson, in turn, hired part-time DJ Will Jackson to book New Wave bands on Wednesday nights. For years, the Lounge, under such names as the Windjammer and the Ice Cube Lounge, had been known best as a place where life got a lot more real than it had any right to be. The stylishly renovated [Downtown] Lounge, booking all sorts of acts, tried for a broader appeal. The first Punk Night, in January 1980, was wildly successful, attracting more than 200 manic punks and curious others. Through the spring and summer, every night the Lounge was open became Punk Night. Suddenly last October, Jackson was out, leaving a month of bookings to his successor. Newcomer Keith Ward presided over the last few months of the Lounge, trying to boost business with an odd combination of good bands from Boston and sock hops. It didn’t work. At midnight last Jan. 1, the liquor license expired, and with it the Downtown Lounge. Jackson, an academic counselor at the University of Southern Maine’s Intown Learning Center, feels there was no simple reason the Lounge went under. A large problem is one that affects the Maine music scene in general, which “excludes New Wave categorically,” he says. Club owners, radio stations and record outlets don’t expose New Wave enough to the music audience, he feels. And various Punk factions dispute among themselves over “who the true representatives of Punk are . . . But the music is the paramount thing, the opening of new avenues of music,” Jackson says. Jackson prefers the term “underground,” which he associates with the creation of good rock on the local garage-band level. During his time at the Lounge, he gave such Portland-area bands as the Stains, the Donns, the Pathetix and the Foreign Students their first crack at a live audience. Jackson also brought several groups to Portland that many people otherwise couldn’t or wouldn’t have seen: Boston’s Pastiche, Lou Miami and the Kosmetix, and even such recording artists as Robin Lane and the Chartbusters, Joe “King” Carrasco and Jonathan Richman. The Landing on Commercial Street is a comfortable, well-laid-out sort of nightclub. Multileveled, it seems to offer a bit of everything: a pleasant bar, a view of the waterfront, an intimate booth, a powerful sound system. Monday nights have attracted fair- to good-sized crowds. The people there one recent Monday didn’t for the most part, seem hard-core Punks, although dress and demeanor are poor criteria. The few Punks there danced and were dressed with a self-conscious flashiness that would have been exhilarating at the Lounge. 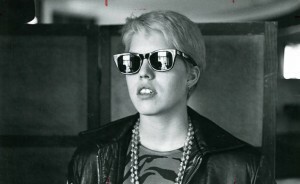 Heidi Wolfe of Tijger in a 1981 image that ran with the Evening Express story. The red marks at the top indicate where the Express cropped it. Doug Hubley photo. At the Landing, amid the beige velveteen cushions and the potted palms, they seemed brave but incongruous, like a bunch of expatriate Frenchmen singing “The Marseillaise” in a wartime New York cafeteria. Kayo’s on Middle Street is small, poor acoustically, with a tiny dance floor; worse, the floor is seemingly unbraced. It feels as if one is standing on a trampoline. At one show recently, two equipment people spent the entire first set trying to keep a massive stack of speakers from waltzing off a counter and squashing the unsuspecting customers. But the bands have included some of Boston’s finest, like Pastiche and the Neighborhoods, and local New Wave groups are appearing at Kayo’s. The crowds have been good, bright and wild. If Kayo’s is cramped, tinny and steamy, that makes it no different from many of Boston’s well-known Punk clubs. If the Punk scene in Portland has suffered for losing the Downtown Lounge, it wasn’t a mortal wound, as demonstrated by Tijger’s popularity, the mob at Kayo’s on Wednesdays, the odd appearances by good New Wave bands at the Music Hall and Ten Union Street. But Portland still needs a room like the Lounge — a big, good-sounding room in which people see and hear the band whether they’re sitting or dancing, where the cover is low and the bands stay away from wallpaper-rock. And where the dancers get to the heart of it all. Doug Hubley is a local musician. This picture by an unknown photographer didn’t run with the Evening Express story, but I had to get my band in here somehow. 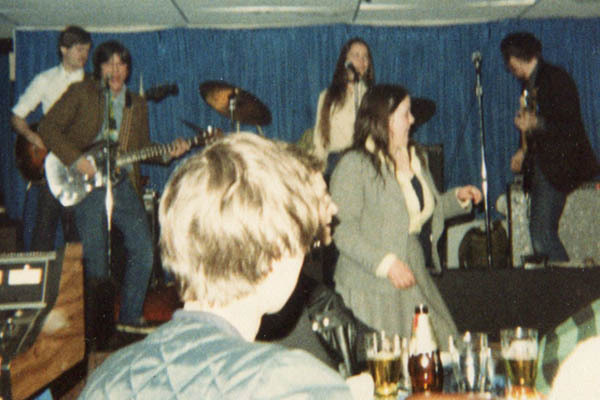 The Mirrors at the Downtown Lounge, 1980. From left: Jim Sullivan, Mike Piscopo, Chris Hanson, Doug Hubley. 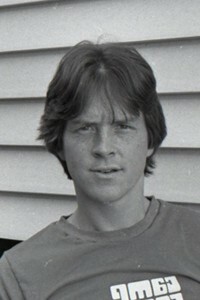 Concealed by Chris is drummer Ken Reynolds. My head looks misshapen because I’m wearing a beret. will jackson joined the band the crayons when dana wilde and ross timberlake convinced him he might have the chops for a new wave power pop band.. ross had rented a space at the corner of middle and pearl street (now greenhut gallery) for his company that made and sold Shaker furniture. they practiced there and one day ross invited steve, who was a managing partner/owner of kayo’s to drop by and have a beer and hang. steve(“kayo”) said, “hey, why not practice over at the club?” THAT is how the kayo’s scene started, despite anyone else’s revisonist thinking. i have little patience for your egotistical brain drain!